KoopaTV: Discover the Final Evolutions of the Starter Pokémon in Pokémon Sun and Moon! Decidueye is AWESOME. Ghost type is unexpected and is just there to troll Gardenia, but look how cool it looks as an archer. My only problem with Decidueye is how counter-intuitive that is to spell. It's almost as bad as Turtonator. Either way, Decidueye is a very stealthy, very speedy, and highly accurate sniper that can down opponents from over half a mile away. I still want to hug it, too. Meanwhile, Incineroar is Fire/Dark, avoiding an otherwise unfortunate, yet possible, Fighting type. I AM INCINEROAR. HEAR ME ROAR. Incineroar's roar literally scared Litten and Torracat away from the rest of the trailer. Look how they shrink in fear. 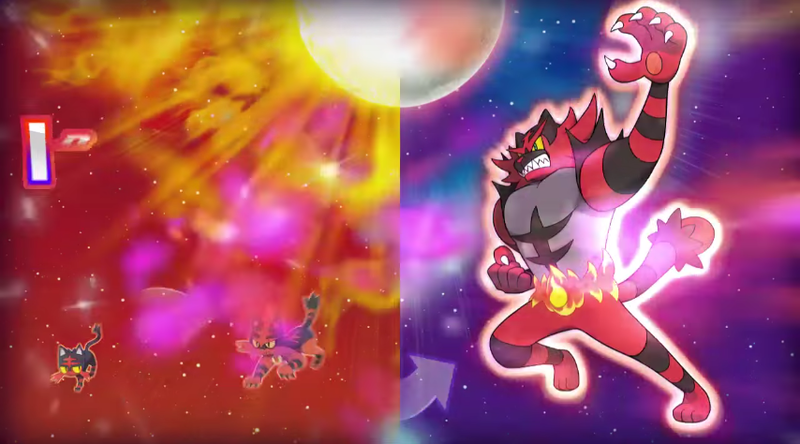 I mean, Incineroar is literally the “Heel Pokémon” species, which is obviously a wrestling reference. Do you know how close that makes it to being a Fire/Fighting? The fire around its waist is literally referred to as the “flame belt”. Its special move is a Lariat. It's also said that “many tend to dislike this Pokémon and keep it at a distance.” This may result in all of the “neko neko nya :3” people who would pick Litten to not evolve it past Torracat. I think it looks like it came from Game Freak's HarmoKnight. Primarima, the Water/Fairy singing mermaid. 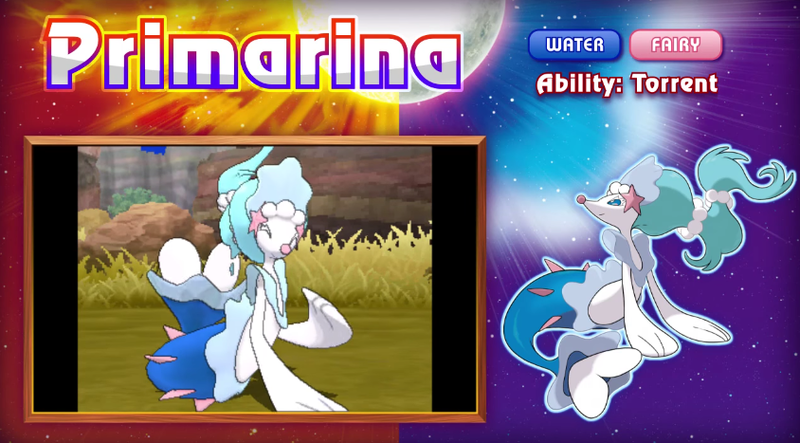 Primarina is a logical progression from Brionne, but without Brionne's pink-eye problems. No complaints. Tapu Koko, the Land Spirit Pokémon. Electric/Fairy. Ability: Electric Surge. Special Move: Nature's Madness, which cuts the opponent's remaining HP by half. Guards Melemele Island. Tapu Lele, the Land Spirit Pokémon. Psychic/Fairy. Ability: Psychic Surge. Special Move: Nature's Madness. Guards Akala Island. 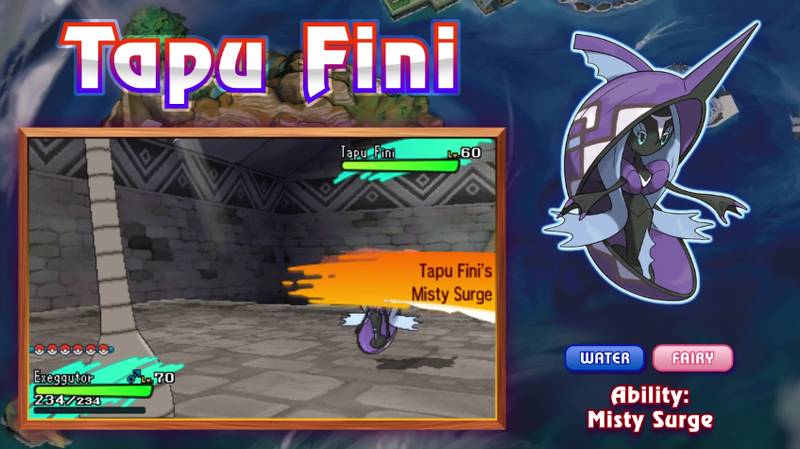 Tapu Bulu, the Land Spirit Pokémon. Grass/Fairy. Ability: Grassy Surge. Special Move: Nature's Madness. Guards Ulaula Island. Tapu Fini, the Land Spirit Pokémon. Water/Fairy. Ability: Misty Surge . Special Move: Nature's Madness. Guards Poni Island. They all have the Special, exclusive Z-Move: Guardian of Alola. 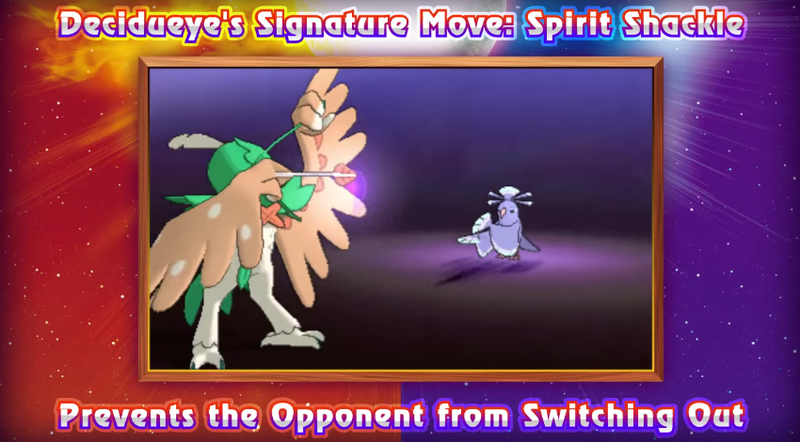 That was the scary Yellow Devil-esque attack you saw in the trailer, which cuts the opponent's remaining HP down to 1/4, or by 3/4s. Basically, this set of Pokémon all want to be addicted to Super Fang, and their special attack is a 50%-more-powerful Nature's Madness/Super Fang. I love all of their designs, by the way. All for different reasons. They're pretty, cool, and/or tug my soul. They're definitely all part of a group, though, with all of their similarities. Yet, the official site still doesn't consider them Legendary. Just... try not to be too distracted by Alolan Exeggutor's goofiness. 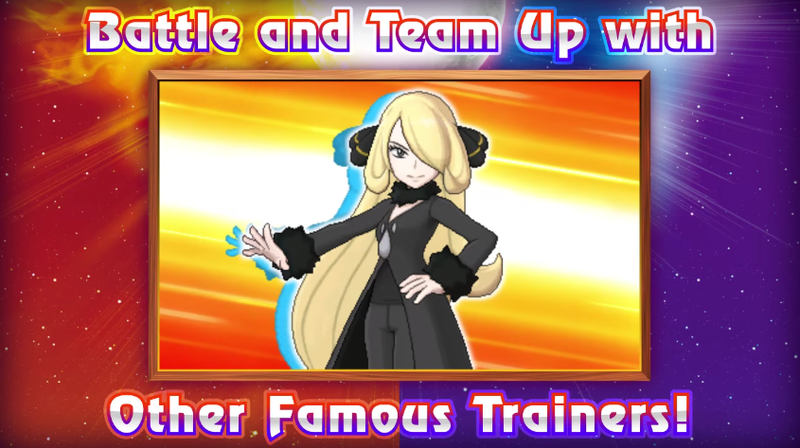 Customising your look to be Cynthia is not enough — she herself appears, in all of her wonderfulness! Hey, maybe you people might be right, that the Aether Foundation are going to be villains after all if they possess some of the few members of the species of sentient black holes in the whole world. OR, they're doing everyone a favour by acting responsible with these Cosmog. They're... heroes! We'll find out. Ludwig is looking forward to going on great adventures and bonding with his to-be Decidueye in Pokémon Moon, though he is pondering whether or not to nickname it something easier. What did you think of this news release? Did it please you? Did it perhaps even change your mind about which starter to pick? Check out the exclusive Z-Moves for these final evolutions! Still Team Litten as I decided to name the player character after my soon to be born child and Litten will have my cat's name. My cat is female but of course no one complains about female Incineroar like they do male Primarima. I wonder if there will be gender differences in their sprites, actually.